Jade is unique in the world of gems because there are several different minerals that are correctly called jade. The history of jade begins as far back as the Stone Age. Jade minerals, including nephrite and jadeite, resist breakage but are soft enough to carve, so they were used to make stone tools by several neolithic cultures, both in Europe and Asia. As far back as ~3400 BC, nephrite was mined in China where it was used mainly as ceremonial carvings and utilitarian objects like cups and incense censers. While the colors of nephrite are muted and soft, the best jadeite from Burma can be rich emerald green with a beautiful jelly like translucence. The QianLong Emperor of China (1735 – 1796 ) fell so in love with the fabulous green jadeites from Burma that he went to war with the King of Burma. After the Chinese suffered a disastrous defeat, the two rulers settled their differences. Chinese lapidaries were allowed to locate in Mandalay so they could buy, process and trade in jadeite between the two countries. To this day, many Chinese people prize bright green Burmese jadeite above all other gems, referring to the best qualities as “feicui” i.e kingfisher green, after the bright green feathers of the local bird. This quality of green jadeite, which looks like mint jelly, is referred to as “Imperial” jade and is one of the most expensive gems on the planet. 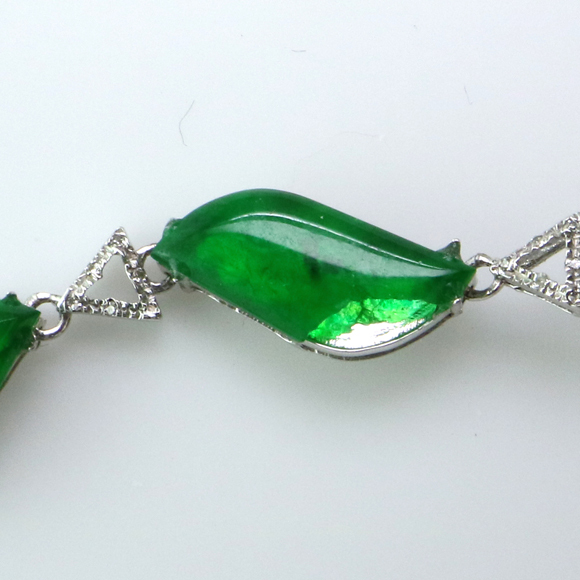 One of our customers purchased a group of jade jewelry items recently on a trip to mainland China. The stones were represented as jadeite. The color and overall appearance is similar to “Imperial” jadeite and the price seemed like a bargain, so he bought two bracelets and matching earrings. Soon after buying , he noticed one of the stones was missing and one was broken. The customer wanted us to replace the two stones but something about the jades didn’t seem quite right. Their color was great but the overall appearance didn’t look like the jadeite we’ve seen. We sent the bracelet to Jeff at Mason Kaye in Denver, a well known jade vendor and expert, for testing to see if the material was dyed. The jade report came back as natural color jade but Jeff couldn’t put a value on the stones. Close examination of this broken piece on one of the bracelets gave us the reason. The jades were cut from very dark green material, shaped into cabochons and then hollowed from the back into a very thin dome– 0.3 mm in fact. That’s about as thick as a chicken’s egg shell! The stones were made to appear translucent by setting the stones over a mirror bright surface. We think these stones may be omphacite jade, a mineral that is a cousin of jadeite. It’s impossible to separate the two using normal gemological tests. Omphacite is generally very dark green to almost black. Like jadeite, the color is derived from impurities of chromium. If this was very dark material to start, the hollowing out technique allows them to appear to be high quality jade. The obvious problem is durability. 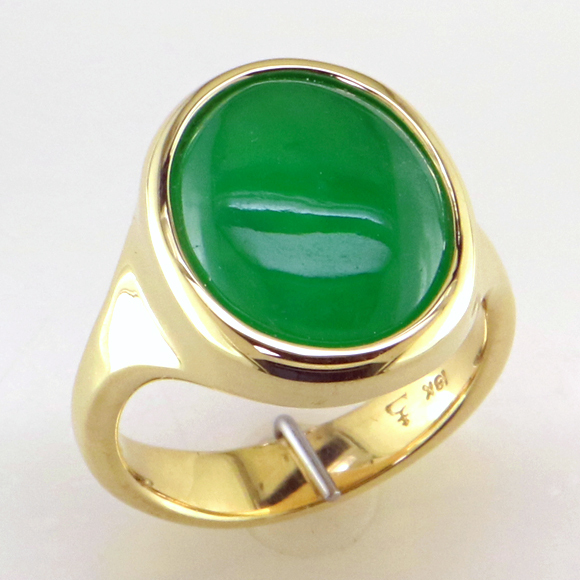 In 2012*, the Gem Trade Laboratory of the GIA tested a stone that appeared to be fine quality green jadeite. The stone tested the same as jadeite with standard gemological tests– same refractive index of 1.66, chrome lines and 437 nanometer line in the visible light spectrum of the desk model spectroscope. One of their gemologists noticed the stone had different look and a somewhat different texture. He tested it with their Raman spectroscope to be omphacite . This was unexpected because the mineralogical description of omphacite showed higher optical properties compared to jadeite. Since this discovery, GIA tested numerous pieces previously thought to be jadeite to be omphacite! GIA has now classified omphacite as a type of jade, described as omphacite jade. We don’t yet know whether fine omphacite jades will equal the value of fine Imperial jadeite jades. We’ve seen some bright green omphacite jades (not hollowed like the above) offered at auction that were similar in appearance to Imperial jadeite. The market will decide, based on availability and how well consumers will accept these type of jade. Obviously, in light of situations like we described above and with issues of jade-like materials like maw sit sit, dyed jade and jade imitations, buyer beware! 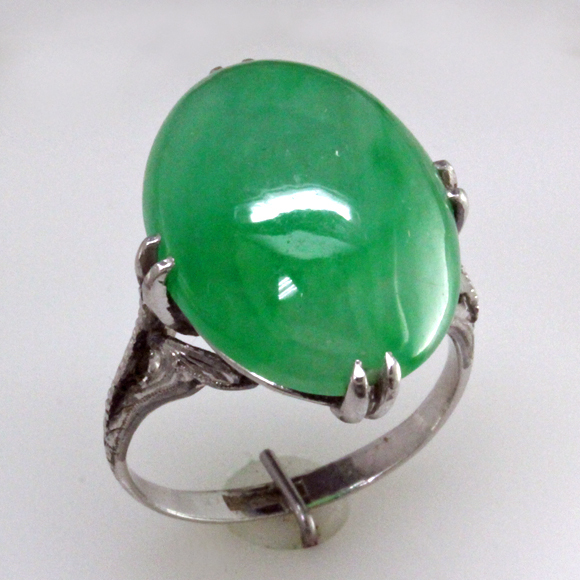 We recommend only buying jade from jade experts and gemologists you know and trust. As members of the American Gem Society, our mission is consumer protection through education, full disclosure and fair business practices– we promise you’ll know just what you are buying and that you’ll pay a fair price for your purchase. This entry was posted on Tuesday, August 21st, 2018 at 11:10 am	and is filed under Estate Jewelry, Gemstones, Jewelry Facts, Jewelry Services. You can follow any responses to this entry through the RSS 2.0 feed. Both comments and pings are currently closed.